Falmouth, capital of the Parish of Trelawny, is situated on Jamaica's north coast near Montego Bay. 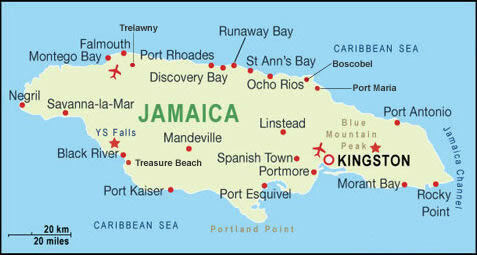 Falmouth is a small town on the north coast of Jamaica, 22 miles from Sangster International Airport in Montego Bay. Falmouth offers an insight into everyday Jamaican town life and its colonial past. Founded by Thomas Reid in 1769, Falmouth flourished as a county seat and market center for the Parish of Trelawny for forty years. Jamaica had become the world's leading sugar producer. The town was named after the birthplace of His Excellency Sir William Trelawny, Falmouth, Cornwall, England, and is noted for being one of the Caribbean's best-preserved historic towns. The town was meticulously planned from the start, with wide streets in a regular grid, adequate water supply, and public buildings. It even had piped water before New York City. During the late eighteenth and early nineteenth centuries, Falmouth was one of the busiest ports in Jamaica. It was home to masons, carpenters, tavern-keepers, mariners, planters and others. It was a wealthy town in a wealthy parish with a rich racial mix. Falmouth holiday has a mix of great beaches and relaxed atmosphere that attracts couples and families of all ages. Falmouth has some great beaches on either side of the town, which is unspoiled ideal for sun worshipers and watersports enthusiast alike. The golden sand beaches stretch for miles and the water is calm perfect for swimming. The beach back drop is frame by lush tropical vegetation, with miles of golden sand, crystal clear water and hot tropical sunshine, the perfect place to relax. Falmouth holiday offers plenty of watersports including bottom fishing, deep sea fishing, sailing, glass bottom boat ride, jet skiing, parasailing, scuba diving and snorkeling. Enjoy a selection of 18 holes golf courses, tennis, horse-riding and river rafting. Most of Falmouth entertainment, dining and nightlife are found in and around resort hotels. Take a shopping excursion to the historic Water Square market, craft market, Montego Bay Marine Park, Glistening Waters, Croydon Coffee Plantation and the Jamaica Swamp Safari (Crocodile Farm).